Today i'm making my first foray into playing interviewer and who better to do it with than the lovely Julia Ahrens of ethical clothing brand Miakoda NYC?! Julia co-owns Miakoda NYC with her sister Laura and is the designer of the duo. The fashion designer and self-professed "former shopaholic turned sustainable lifestyler vegan yogi" kindly answered some questions for me and her answers only made me fall more in love with her and the brand even more. Damn, what a cute pair. Laura, left; Julia, right. -For those who aren’t necessarily aware of the ethical fashion movement or how it can impact the earth and its inhabitants as a whole, could you give us a brief summation of the importance of the movement? Of course! First I recommend watching The True Cost documentary—it can definitely give you a really eye opening and thorough explanation about how fast fashion is destroying our planet and why ethical fashion is so important. But here’s my short version (or at least one that won’t take two hours to read). The way we consume has changed drastically. In the past 20 years, clothing consumption has increased about 400% ! There are approximately 150 billion garments made every year, and Americans alone throw away about 14 million tons of clothing each year—that’s 80 pounds per person! The amount we consume is a huge issue, but WHAT we are consuming contributes to how horrible this consumption really is. Most clothing is made by women in other countries who are paid way beneath a fair living wage. The majority of these women live in poverty and work in unsafe conditions where they are subject to verbal and physical abuse. The clothing that they are sewing is made from conventionally grown (meaning not organic) fibers and synthetics (think plastic and chemicals). These materials are extremely toxic for the garment workers AND for the farmers AND our planet. Cotton—the fiber advertised as being natural and wonderful is one of the most chemical laden and toxic materials on the planet. It uses a heavy amount of insecticides and pesticides when not grown organically. Communities living around cotton farms are known to have higher levels of sicknesses including cancer. Find my video on my Miakoda collection here. 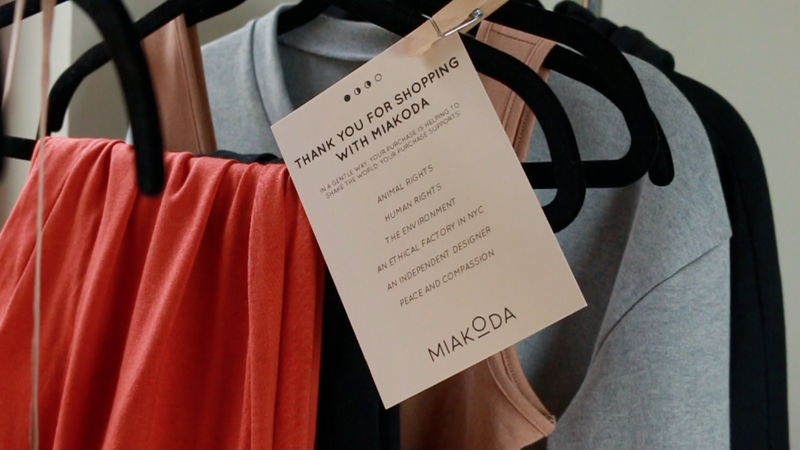 -What spurred on your interest in ethical fashion and how did Miakoda come about? I originally started Miakoda with the mission to create a vegan clothing company. I graduated from Parsons School of Design and had recently gone vegan about a year before. Unlike many that go vegan as a way to change their diet (whether it be to help animals or for health), I went vegan as a way to give up my long-standing relationship with leather shoes. I wanted to work for a company that took animals out of the fashion equation but at this time, very few companies, especially the ones that were recruiting me for jobs, were doing this! -What was the first piece you designed? 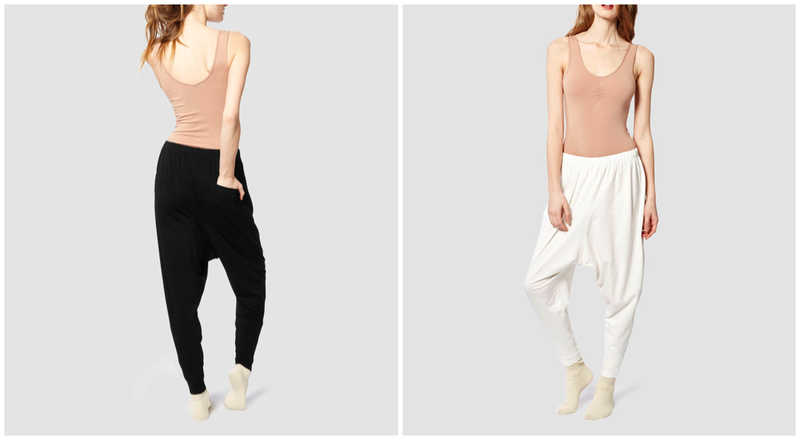 The first piece I designed was our slouchy pants! They were actually one of the pieces that I designed during my senior year of college as part of my college thesis! The original slouchy pant was white and made from a bamboo fabric. They were the most comfortable pants I had ever worn, so when I started Miakoda, I knew I had to include them in our first collection. They were so popular and continue to be one of our best sellers four years later! -How has Miakoda evolved since inception? I think the biggest evolution that Miakoda has had since inception is our desire to educate. When we started Miakoda, we wanted to give people an option that was sustainable and ethical BUT so comfortable and cute that shoppers would buy our collection without realizing that they were making a positive impact on the industry and our world. Now, four years later, we realize how important education is in order to create change. Passively making a good decision and purchase is fine, but in the long run, in order to making a lasting impact on our world and the fashion industry, people need to KNOW. Knowledge is power, and knowledge creates change. We live ethical fashion every day in our roles as consumers and as company owners, but most people have never heard of the term “ethical fashion” and many who have don’t even know what it really means or why its important. Our goal is to make consumers feel empowered by their choices. We can vote with our dollars and we want people to feel like they can make a difference by supporting small companies that are implementing good practices. -What do you see for the future of Miakoda? Our goal is to keep growing Miakoda. We are a super small company, but we have the most amazing customers and followers who support our mission. Our goal is to grow our family (of employees, customers, and followers) to reach an even bigger group of people to educate about ethical fashion and give people options to shop without contributing to bad practices. -Lastly, can you tell us about Pigeon? Heheh, yes of course! Pigeon is our mascot! It’s somewhat of a long story, but to make a long story short, we found pigeon about 11 years ago when I was still in high school! He was a baby pigeon that had been abandoned. He was running into one of the main roads in our neighborhood and chasing humans down the street. The minute we saw him, we knew something was wrong. We got some gloves and a box and called a million animal sanctuaries and rescues asking them to take a look at him. 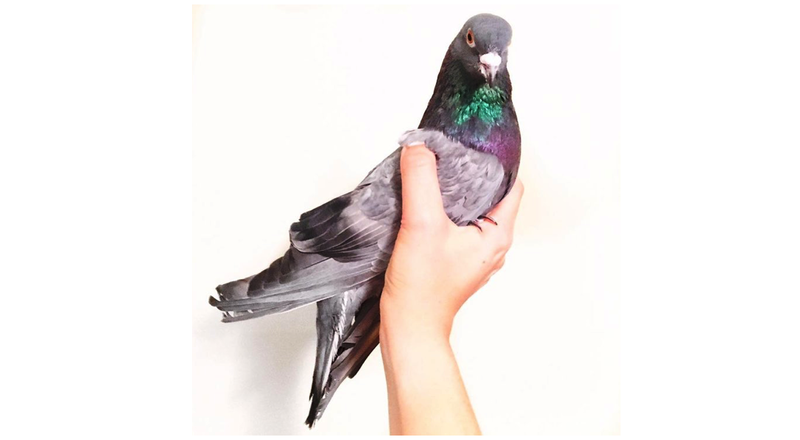 Apparently pigeons are ‘domesticated’ animals, and no wildlife refugees would take him. We brought him to our local vet and he told us that Pigeon was extremely malnourished and very young. We took him home with the intention of rehabilitating him, getting me healthy, and releasing him back into the wild. For weeks we fed Pigeon with a tube, keeping him warm, and whistling to him and playing music to make him feel calm and happy. He got very used to snuggling inside my hoodie kangaroo pocket and landing on the heads of my dog and cats. When it came time for his release, we realized that he would not last a day in the wild. He thought that other animals (including feral cats) and humans are friends…. and his flying skills are incredibly subpar. Pigeon has become one of our family members—and because his flying skills are so terrible (sorry, Pigeon), we have made him the head of our shipping department. Although he may not be able to fly far and wide, he can help us deliver packages to awesome customers all over the world, spreading his reach even farther than his wings ever could! A huge thanks to Julia for answering my questions and of course for collaborating on this video with me. Its no secret that i'm a huge fan of the brand so its awesome to be able to share them with you! You can find their comfortable wears right here.